Alternative investments are growing in popularity as investors seek out returns and income with lower correlation to traditional stocks and bonds. Such strategies have historically been offered through private hedge fund structures. But, on October 4, the Canadian Securities Association published final amendments to key mutual fund regulations known as NI 81-102, which will make it easier for investment managers to offer liquid alternative strategies to the general public. The new rules formally create a new class of product called “alternative mutual funds,” which will have additional flexibility to pursue less traditional – but liquid – investment strategies as compared to a long-only mandate. While not exhaustive in scope, the following list compares some of the key features of alternative and conventional mutual funds1. Graeme Cooper is the product manager at Purpose Investments responsible for alternative funds. We spoke to Graeme about how the proposed changes to NI 81-102 will impact investors, advisors and the industry as a whole. Q: What are the major changes expected to happen when the CSA moves ahead with its proposal on liquid alternatives? We expect the implementation of the new rules will result in the broader acceptance of liquid alternative strategies within the Canadian retail market. Although the door has been open for such strategies through the existing commodity pool structure – and we have had product in the market for years – we can already see that the proposed regulations are bringing such strategies into the mainstream. This will be a game-changer, particularly given the timing as investors increasingly look for viable options to make a decent return while de-risking equity exposure with this bull market coming into its final innings. There is precedent for this, as Canada is largely following the model established in Europe and the US. As this is new to Canada and there has been, to this point, little in terms of access to alternative investments, we expect the direction of alts will certainly be up. The only open question is ‘by how much?’ We expect the answer will depend to some degree on the direction of equity market volatility, with investors showing more of an appetite to explore alternatives as the bull market shows signs of greater stress. Q: What do these changes mean for everyday retail investors? These regulations will facilitate a much greater ease of access to alternative investment strategies that have historically been the domain of institutions and high-net-worth investors. Everyday investors will now be able to purchase alternative funds without meeting potentially prohibitive investment minimums and without dealing with the cumbersome paperwork associated with private hedge fund vehicles. Added flexibility in portfolio construction is a good thing, but the additional degrees of freedom can involve different kinds of risk. Due diligence, particularly around risk management, is much more important in the alternatives space. Although it is wrong to think of hedge funds (the historical vehicle of choice for alternative strategies) as inherently riskier than beta-oriented strategies, greater leverage capacity carries higher potential risk if used inappropriately. This is why selecting the right investment managers is critical. We believe it is important for managers to have experience running these kinds of portfolios and testing their respective risk management disciplines through periods of genuine market turbulence, such as the global financial crisis of 2008. In the right hands, alternative strategies should be expected to dampen portfolio volatility and improve risk-adjusted returns, and this is a good thing. We would just caution investors to do their research and seek out managers with direct experience using these tools through periods of significant market disruption – when diversification is most valuable. Q: What do the changes mean for investment advisors and other professionals in the industry? We think this is a great opportunity for advisors to become subject experts and differentiate their practices through the breadth of products they are able to incorporate in each respective portfolio solution. Institutions have embraced alternatives because they are useful tools to increase the probability of achieving their return objectives while reducing the risk taken in doing so. Retail advisors will soon have access to similar tools. These tools can enable advisors to build more resilient portfolios, which is key to the value proposition of the products we offer at Purpose. With consensus building that this historical bull market is getting pretty long in the tooth, investors need viable options to de-risk and re-allocate into. Cash still doesn’t pay a lot and the duration of traditional fixed income is uncomfortable in a rising-rate environment. This makes for good timing with respect to the regulatory door opening to alternatives. We believe they provide the most compelling solution for advisors to de-risk client portfolios without meaningfully impairing expected returns. Q: Purpose Investments has offered alternative products for many years – how was that possible under the old regulatory system? How will the changes impact those funds and any new offerings? We have indeed been leaders in providing sophisticated alternative products under prospectus, in both ETF and mutual fund structures. Our flagship alternative fund, Purpose Multi-Strategy Market Neutral Fund, has been building a strong track record since October 2014. It recently won the 2018 Canadian Hedge Fund Award for Best 1 Year Return in the Market Neutral category. At Purpose, we have always held the view that the strategy should be separate from the vehicle. In this sense, we looked at the strategies our portfolio managers could make available through offshore hedge fund vehicles, and cherry picked those that could be incorporated into the existing commodity pool regime. It’s surprising how little compromise was actually required, so we now find ourselves coming into this new regime with a tried and tested product. To be honest, the new regulations will not have a meaningful impact on our existing products. They may open things up for some modest enhancements in our process of continuous improvement, but the bigger impact will be driving these strategies more generally into the mainstream. We feel we are well positioned in the market given our experience and pedigree with existing products and proven track records. Q: How can alternative investments fit into a portfolio? Alternatives can fill multiple roles in a portfolio, but these all generally distill to providing a diversified source of attractive absolute return that is uncorrelated to traditional market betas. The twin bull markets across bonds and equities have been historic in terms of duration and magnitude. With the interest-rates tailwind dissipating and now appearing to have definitively reversed, and equity valuations looking increasingly stretched, a lot of investors are questioning the future performance of the traditional balanced portfolio (60% equities/40% fixed income). We are not in the business of making definitive calls on broad market direction, but we recognize the risks along with everyone else and believe they make a strong argument in favour of increasing alts exposure. We believe investors should be looking at de-risking both their equity and fixed-income allocations in favour of strategies that are proven to deliver diversification, particularly when it matters most. Even as cash rates recover from historic lows, a well-constructed alternative strategies portfolio provides a superior option in terms of reducing portfolio risk without making a meaningful compromise on expected performance. Certain statements in this document are forward-looking. Forward-looking statements (“FLS”) are statements that are predictive in nature, depend on or refer to future events or conditions, or that include words such as “may,” “will,” “should,” “could,” “expect,” “anticipate,” intend,” “plan,” “believe,” “estimate” or other similar expressions. Statements that look forward in time or include anything other than historical information are subject to risks and uncertainties, and actual results, actions or events could differ materially from those set forth in the FLS. FLS are not guarantees of future performance and are by their nature based on numerous assumptions. Although the FLS contained in this document are based upon what Purpose Investments believe to be reasonable assumptions, Purpose Investments cannot assure that actual results will be consistent with these FLS. The reader is cautioned to consider the FLS carefully and not to place undue reliance on the FLS. Unless required by applicable law, it is not undertaken, and specifically disclaimed, that there is any intention or obligation to update or revise FLS, whether as a result of new information, future events or otherwise. “Alternatives” is a name given to a very wide range of assets. However, at the broadest level, they encompass any investments outside the realm of traditional asset classes such as cash, equities, and fixed income (see Appendix for some of the more common definitions). Investors use alternative assets for a variety of reasons, including diversification and risk-management. Whatever the reasons for adding these asset classes to a portfolio, use of these assets is increasing and will likely continue to grow in the years ahead. This primer aims to provide a basic overview of why alternative assets continue to gain traction and simple ways to incorporate alternatives into an investment portfolio. Investors use alternative assets for various reasons. They’re uncorrelated to most other asset classes, and so provide excellent diversification and risk-management benefits. Depending on the asset type, they can also provide everything from protection against inflation, rising interest rates, or market volatility to higher yields or returns. 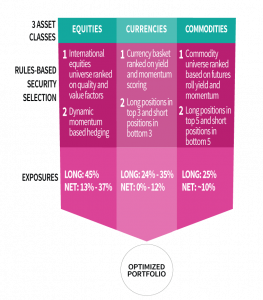 Whatever the reasons for adding these asset classes to a portfolio, use of them is growing. In fact, a study by McKinsey1 suggests that globally, the compound annual growth rate of key alternative asset classes – including real assets, private equity and hedge funds – outstripped that of traditional assets by 2.9% between 2005 and 2015. Diversification is important for maintaining a well-constructed, resilient portfolio. One way to do this is to ensure the different portfolio components or asset classes have uncorrelated return streams (i.e., their values move in different directions through the market cycle, so portfolio returns don’t all move up or down at the same time). This smooths out overall portfolio returns and provides for a less volatile investment experience. In decades past, asset classes such as REITs and high-yield bonds provided uncorrelated sources of return to a typical Canadian balanced portfolio2. However, since the financial crisis, these correlations have risen (Exhibit 2). Source: McKinsey, “Thriving in the New Abnormal: North American Asset Management”. Source: Morningstar Direct, based on monthly returns as at July 31, 2018. Traditional Canadian balanced portfolio, as represented by a combination of 60% Canadian equities (S&P/TSX Composite Index) and 40% Canadian bonds (FTSE TMX Canada Universe Bond Index); Global REITs by the S&P Global REIT Index; global high yield bonds by the Bloomberg Barclays Global High Yield Index. All indices reported in Canadian dollars. What we now consider alternative asset classes, meanwhile, still provide low or even negative correlations to the same Canadian balanced portfolio (Exhibit 3). During the height of the financial crisis in 2008, many of them actually saw lower maximum drawdowns (Exhibit 4). Source: Morningstar Direct. Correlations based on quarterly returns from January 1, 2008 to July 31, 2018. While bonds continue to have low correlation to stocks4, this may not provide investors with much comfort in the years ahead. The unprecedented interest-rate declines across the globe that have been such a tailwind for investors over the past 30-plus years have pushed both equities and fixed-income securities to historically high valuations. A new era of flat-to-rising interest rates could mean we won’t see the same strong performance we’ve come to expect. From January 1981 to July 2018. Source: Bloomberg LP, Purpose Investments. For illustrative purposes only. Risk as measured by standard deviation. Research from McKinsey examining US public pension funds supports this view. Going forward, it estimates the gap between the 60/40 portfolio return expectations and reality is as much as 5.2% (Exhibit 8), depending on the economic environment ahead. Depending on the asset class, alternatives may provide another source of diversified returns and/or yields. In the years since the financial crisis, equity volatility5 has trended lower, and even reached all-time lows in November 2017. Dampening of volatility is widely considered to be one of the consequences of quantitative easing (QE). As a result, the bond-buying and ultra-low rates that central banks put in place to deal with the financial crisis have driven investors searching for yield into riskier assets. In addition, investors have come to expect that central banks will step in with more QE whenever the economy appears likely to hit another roadblock. Central banks, though, have started to reverse course. This is worrisome, as many investors may find they’re ill-prepared for a macro event that returns volatility to long-term average levels. Case in point: the last time markets saw this level of complacency was in 2007. In addition, hawkish central bankers may prompt more significant selloffs in bonds, pressuring fixed-income holdings. The bottom line is that there will be fewer places to hide. Going forward, most investors will need to diversify beyond stocks and bonds to manage risk, increase yields, lower portfolio volatility, and ultimately, reach their long-term financial goals. Faced with long-term liabilities, sophisticated institutional investors such as sovereign and public pension funds have recognized the need to further diversify. They’ve responded by adding alternative assets to their portfolio mix over the past decade. In fact, PwC estimates global allocation to private equity, real assets and hedge funds will grow to US$13.6 trillion to US$15.3 trillion by 2020. Based on PwC’s estimated growth of pension fund assets to US$56.6 trillion by 2020, this translates into 24% to 27% allocation to alternative assets. When markets turn volatile, investors are cautioned to focus on a long-term strategy and ignore the ups and downs. This is always good advice, but diversifying beyond the traditional balanced portfolio with alternative investment strategies is also important. We look at alternatives as generally falling into two buckets: alternative strategies and alternative diversifiers. Both are important and have a place in a properly risk-managed portfolio. However, they each figure differently in the portfolio construction process. Alternative strategies involve thinking about and using traditional asset classes such as bonds and equities in different ways. After the precipitous decline in interest rates over the past 30-plus years, a flat-to-rising-rate environment will not be very supportive for fixed-income returns. Going forward, bonds may generate an average of 2% to 4% annually. However, what’s more concerning is that the historical 1:1 risk-to-return ratio for the asset class is likely to rise. Consequently, the real job of alternative strategies for fixed income is going to be managing risk. This can be done by adding investment funds and other products to your portfolio that employ interest rate hedges to lower duration, help preserve capital and reduce the risk-return ratio. Going forward, a higher allocation to equities than the conventional 60%6 is likely going to be necessary, because a 40% weighting in an asset class that yields 2%-4% won’t be enough for investors to reach their long-term financial goals. However, a higher allocation to equities will inevitably increase portfolio risk, due to the higher volatility generally associated with stocks. Managing risk at the equity level can be achieved not just through sector and geographical diversification, but also through an intelligent equity risk-management strategy. For example, the majority of a portfolio may be invested in long equity positions, but some market beta7 and risk can be tactically hedged out by taking short positions in broad market indices. This type of long/short strategy helps not only to diversify the portfolio, but also to prevent a 1:1 beta to the ups and downs of equity markets. Investors may also manage risk by diversifying the sources of volatility, such as through options strategies. Mining volatility over the last 10 years has been an attractive alternative investment strategy, providing moderate diversification and low correlation to long-only equity portfolios. As a replacement for some long equity positions, options strategies can provide similar returns with lower volatility. They can also be used as a high-income alternative to lower-yielding fixed-income assets. Diversifiers may include infrastructure, real estate, commodities, currencies, private equity and debt, venture capital, and more (see Appendix for more details). It may also include adding certain hedge fund strategies that are going to provide a different outcome and return stream than traditional equities or bonds. This will serve to diversify the entire portfolio. When alternative strategies and diversifiers are used together, investors can achieve enhanced portfolio returns with lower associated volatility than a traditional 60/40 portfolio alone. Alternative assets such as hedge funds are designed largely for institutional and other accredited investors. In addition, most strategies require complex forms and paperwork to be completed. The level of transparency is low, compared with other investments such as publicly traded stocks, ETFs and mutual funds. Detailed public information about strategy, performance and holdings is not widely available. Many alternative assets are highly illiquid. Investors may not be able to get their money out, or have a ready market if they need to sell before the end of the holding period. Alternative products generally have higher management fees than traditional mutual funds and ETFs. They may also include performance fees. Performance can be difficult to measure, particularly against a benchmark. While not an exhaustive list, the following are some of the more common types of alternative investments. Historically, alternatives have included asset classes such as real estate and infrastructure. This is still true in the case of direct investment in commercial or residential real estate, or physical infrastructure assets such as toll roads or airports. However, publicly traded REITs and infrastructure companies – and specialty funds that invest in them – have grown substantially in popularity, providing broad, liquid access. For this reason, these assets are largely considered to be mainstream equity – and don’t necessarily provide an uncorrelated source of return to a traditional stock and bond portfolio. Options are contracts that allow an investor to buy or sell an underlying security – often a stock or ETF, but can also include commodity futures and currencies – at a specified price on or before a predetermined date. Options can be a great addition to a portfolio, providing diversification benefits, a potential source of income, and a way to manage and/or reduce risk. They are also widely accessible to retail investors, especially since the introduction of sophisticated put and call writing strategies in mutual fund and ETF format. For more detailed information on this asset class, read our Introduction to Options. Whose net income before taxes exceeded $200,000 in each of the two most recent calendar years or whose net income before taxes combined with that of a spouse exceeded $300,000 in each of the two most recent calendar years and reasonably expects to exceed that level in the current calendar year. Some of the more widely known hedge fund strategies include the following. Long-bias equity, which maintains more long exposure than short in the portfolio. An example of this is a 130/30 fund, which would be long 130% equities and short 30%. Short-bias, which maintains greater short exposure than long. Paired trades, where a long position in a stock in a particular sector is offset by a short position for the same amount of money in another stock. An example of this might be a case where the manager believes interest rates are going to rise. The manager might take a long position in a bank, which would generally be expected to profit from rising rates, and a short position in a REIT, as real estate equities tend to be sensitive to short-term interest rate movements. Most traditional equity strategies are tied to a benchmark where performance is measured relative to an index. Absolute return strategies, meanwhile, are not tied to any particular benchmark. Instead, the aim is to generate positive absolute returns over the long term, through all types of market conditions. These types of investments are generally less constrained, and managers have more freedom to play in different asset classes, according to market environment. In this type of strategy, the manager would analyze M&As, restructurings, bankruptcies, and other company-specific events and take positions depending on the expected outcome. For example, in the event of a merger between two companies, the manager might take a long position in the stock of one of the companies and a short position in the other. While markets are generally thought to be efficient, there are times when the pricing of certain securities doesn’t match their inherent value. Relative value strategies are designed to exploit these inefficiencies or anomalies. For example, two oil refiners may be priced similarly, but the manager may believe that one is overvalued while the other undervalued. Based on this analysis, the manager might choose to short the overvalued security and hold the undervalued one. These strategies may take long or short positions in a variety of asset classes, including equities, fixed income, currencies and/or commodities, based on the manager’s assessment of events or developments, whether positive or negative, in global markets. Multi-strategy funds may use a number of different strategies, including those listed above. The ultimate goal is to generate positive returns with less volatility than a single-strategy fund. Multi-strategy funds provide investors with diverse exposure to multiple asset classes in one fund. Like hedge funds, the term “commodities” actually encompasses several different physical markets. “Soft” commodities, for instance, include agricultural products such as wheat, sugar and coffee. “Hard” commodities, meanwhile, include base metals (e.g., copper, iron), precious metals (gold, silver, platinum, palladium), and oil. Commodities also include futures markets where these hard and soft commodities trade. Private equity is direct investment in the shares of private companies that are not publicly traded on a stock exchange. Because they’re not publicly listed, private-equity investments tend to be less liquid, and long holding periods may be required. In addition, transparency is an issue because these companies are not required to comply with the same disclosures and regular financial reporting as their public counterparts. For these reasons, they are generally the domain of institutional and accredited investors. Private debt includes non-publicly traded fixed income securities such as distressed debt, direct lending, mezzanine financing and structured financing. This asset class is useful for companies that cannot access traditional bank lending. Some examples are small- or medium-sized businesses, start-ups, companies that are complex in nature, and even those in need of financing to avoid bankruptcy. Debt instruments of private companies are popular with many institutional and other accredited investors, as they generally have low correlation to traditional investments such as equities and high yield, corporate and government bonds. However, like many private equity securities, they also tend to be relatively illiquid and can require long holding periods. 2An exception to this is commodities, but given the high allocation to natural resources on the S&P/TSX Composite Index, this is not surprising. 3In Exhibit 3 and 4, Canadian balanced portfolio represented by a combination of 60% Canadian equities (S&P/TSX Composite Index) and 40% Canadian bonds (FTSE TMX Canada Universe Bond Index); commodities by the Bloomberg Commodity Index; equity market neutral by the Credit Suisse Equity Market Neutral Index; long-short equity by the Credit Suisse Long/Short Equity Index; hedge funds by the Credit Suisse Hedge Fund Index; long-short credit by the Morningstar MSCI Long-Short Credit Index; and global macro by the Credit Suisse Global Macro Index. 4During the January 1, 2008 to July 31, 2018 period, Canadian equities (as measured by the S&P/TSX Composite Index) and Canadian bonds (as measured by the FTSE TMX Canada Universe Bond Index) had a correlation of -0.02, based on monthly returns. Source: Morningstar Direct. 5As measured by the CBOE Volatility (VIX) Index. 6Assuming a traditional 60% equity / 40% fixed income portfolio. 7Beta is an historical measure of the risk an investor is exposed to by holding a particular stock or portfolio compared to the market as whole. Beta is calculated using regression analysis, and you can think of beta as the tendency of a security’s returns to respond to swings in the market. A beta of 1 indicates that the security’s price will move with the market. A beta of less than 1 means that the security will be less volatile than the market. A beta of greater than 1 indicates that the security’s price will be more volatile than the market. For example, if a stock’s beta is 1.2, it’s theoretically 20% more volatile than the market. 8Source: National Instrument 45-106 Prospectus and Registration Exemptions (NI 45-106), Section 1.1. With interest rates now off their historic lows, investors should consider what role floating rate loans can play in building a resilient portfolio. Slotting in to the fixed-income portion of a portfolio, floating rate loans provide a variety of features that can add diversity and capital protection. The benefits make loans an attractive candidate for a permanent allocation in a portfolio. Floating rate loans typically generate among the highest yields of all fixed income asset classes, significantly higher than government bonds. Additionally, the income is stable, helping to balance out any volatility in the underlying loan prices. The coupons on floating rate loans generally reset every 30 to 90 days. This gives the loans a near-zero duration, and when combined with historical yields, the highest ratio of yield per unit of duration versus other major fixed income asset classes. The senior secured position of loans in the capital structure helps reduce credit risk to investors. Loan investors get priority for repayment in the event of a default. Because of their floating rate coupon, loans have historically outperformed the broader fixed income market in flat and rising-rate environments. They have also historically provided investors with lower volatility compared to other risky and long-duration assets. For more on why floating rate loans may be a good fit for your portfolio, read our white paper. Alternative strategies are coming into focus increasingly as the economic cycle enters the late innings. One of the most powerful tools investors can add to their portfolios is what’s commonly called a market neutral strategy. It was once reserved for hedge funds and their exclusive clientele, but innovative solutions are now giving everyday investors the chance to access the strategy in easy-to-use mutual fund and ETF formats. Frank Maeba is one of the portfolio managers at Neuberger Berman Breton Hill ULC who runs Purpose Multi-Strategy Market Neutral Fund (PMM). A number of new alternative-strategy mutual funds and ETFs are coming into the marketplace, but PMM is the only one with a strong track record of performance. We spoke to Frank about all the moving pieces in the strategy, how they fit together and how investors can use a market neutral strategy such as PMM to build a resilient portfolio. Q: “Market neutral” is one of those terms that can have different meanings to different people. How do you define it? It’s keeping a low net exposure to whatever market you happen to be trading. It could be a low net exposure to equities or commodities or currencies, like we have in PMM. Underneath the covers, what makes up the net is a long position or long exposure coupled with a short position. So really, if you take a low net directional exposure, you’re trying to make money off of your long exposure going up and your short exposure going down. In this particular fund, we do that across multiple classes. Q: How is market neutral different than trying to time the market? When you’re timing the market, you try to pick tops and bottoms and you’re taking more directional exposure. In market neutral strategies, you tend to have more static exposure made up of longs and shorts. You’re not really trying to make money so much on your net exposure. It comes down more to a security-selection bet. So, you want to pick good longs that you think are going up and you want to pick securities that you think are good short candidates. I would say that security selection plays out over a bit of a longer period; it’s more of a medium-term trade. And you’re trying to hold those long and short positions because you think the combination can add alpha or absolute return in more of a medium-term sense. Q: How do you decide how much weight to put into equities, commodities and currencies? It’s a portfolio-construction exercise. We’ve done a lot of research and it’s our own personal experience about what asset classes we think can drive returns. When you set up market neutral strategies, what you’re trying to do is hopefully get the benefit of diversification across multiple asset classes with a low correlation or beta, usually to equity markets. The way that we set up PMM is through a combination of equities, commodities and currencies. If there are four total units of risk, two units of that would be coming from equities, one unit from commodities and one from currencies. Because we’re using many different types of securities or instruments across these asset classes, you get a big diversification benefit across the board. That’s definitely something we’re striving for across the portfolio. Q: How do you decide which individual stocks, commodities or currencies to include, which to avoid or which to short? We have quantitative screens that help us identify instruments that we want to take long positions in across each asset class. In equities, we want to be long stocks that offer good value or are cheap. Maybe they have good momentum, good cash flows or good balance sheets – quality-type metrics. In general, those are stocks that have performed over time and you want to be long those kinds of securities. On the short side, we want to control market risk or beta using index futures. We couple this long position in individual equities with a short index-futures hedge. That can be dynamic in nature. So, if markets happen to be going down in a 2008-type scenario, we’re going to increase the size of that short index-futures hedge. Conversely, if markets are going up and we want to get more return out of the long side of this trade, we’ll cut the size of that index-futures short. So basically, the net market exposure can vary a little bit, but really, we’re trying to drive returns from the alpha we can generate out of the long side of that equity trade. In currencies and commodities, it’s a little bit different. So, we’ll go long commodities that we think benefit from two main drivers: long momentum and long roll yield. Momentum is basically that winners will continue to be winners and losers will continue to be losers. It’s a very powerful factor that can drive commodity returns. The second thing is the shape of the futures curve. If a commodity curve is downward sloping, in general you get paid to hold those futures contracts as they tick over to expiration. Similarly, on the short side, you want to be short commodities that have a negative roll yield or are in contango and basically, you’ll be paying to hold them. In general, those are good candidates to short – you get paid to roll the exposure forward. Based on those kinds of key factors, momentum and roll yield, that’s how we set up the securities-selection process for our longs and shorts across commodities. In currencies, it’s a similar process with slightly different drivers. We are looking for a shorter-term momentum signal across currencies – usually around three months, whereas in commodities we’re looking at around six months. Probably the most powerful driver for the currency-selection process is the nominal yields or interest rates across those countries. Across time and through research and our own experience, what we see is that currency flows go into countries that have higher nominal yields in general. Outflows or currency depreciation will occur in countries that have lower nominal yields or even flat or negative nominal yields. In general, we want to be long currencies that have high nominal yields and positive momentum, whereas our shorts have low to negative interest rates and negative momentum. Q: How different might the strategy look in the early part of a market cycle versus the late stages of the cycle? It morphs over time. You can’t predict with certainty what is going to be the driver of returns across a portfolio like this. Part of the reason we trade so many diverse asset classes and instruments is that a subset of those in the portfolio can actually drive returns at any point over a cycle. So, you’re never quite sure, especially in the macro sense, what particular trade or strategy is going to be in favour at the time. Over the last couple of years, the makeup of the book has actually been longer equities and not so heavy on the index-futures hedge. That’s really just because equities have continued to make new highs. Coming out of 2008, it’s basically just been a straight line up for the last 10 years. So, trying to identify good stocks to play the equity rally and minimizing the size of the index hedge has been generally a good way to play equities over the last couple of years. Currency wise, it’s been a little choppier. The biggest trend has really been long US dollars and long emerging market currencies over the last two years. But that dynamic can also change. Emerging market currencies right now seem to be under a bit of pressure. So, what we’re trying to do is maximize our longs in the US dollar versus currencies such as the euro, for instance, which is negative yielding and has been under pressure for a couple of years. And then going long selective emerging market currencies that have high nominal yields and positive to flat momentum in this environment. That position in particular has seen volatility up and down. We saw shocks in the Swiss franc three or four years ago and we were able to navigate through that position fairly well. The key to playing currencies is not only identifying things you want to be long and short in, but also sizing it properly so that you’re never overly concentrated in just one position. We really try and diversify across these kinds of trades. Commodity returns have been mostly driven by what’s been happening in the energy complex lately. During the big selloff in 2015 and 2016, the returns were really driven out of a short posture across energy. But lately, commodities have been performing well and we’ve flipped to a more risk-on posture where we’re long a lot of the energy complex. That gives you kind of a feel for why we add commodities. You can make money on the long side or the short side. That is very diversifying, especially when you’re trading it in a basket. Q: How much research overall goes into running a market neutral strategy like PMM? The partners who created this Fund, in one way or another, have been trading these types of strategies for over 20 years. We’ve been managing this particular type of strategy since 2006. In terms of the quantitative and research horsepower behind it, we have a fairly large team. There are 15 people involved in quantitative research. We have a 40-person analyst team which provides fundamental insights. We have a five-person team of data scientists which is really keeping us on the cutting-edge of technology and alternative types of research. It’s an evolutionary process. The core construction blocks of the Fund remain constant over time, but if we can find incremental improvement, that’s something we always strive to do. Q: What’s the benefit of adding a market neutral strategy to a portfolio? Over the last decade or so, you pretty well had to be invested in equities and bonds. They both rallied together and that’s not usually par for the course. Usually, people have bonds in their portfolios to hedge against equity risks. But, in the case of the last 10 years, it’s been a special period for risk assets, mostly driven by central banks. And now we see that times are changing. The US Federal Reserve is hiking rates, central banks are removing stimulus policies, equities are pretty well at all-time highs and you can no longer count on bonds to be your incremental hedge against risk assets because bonds are also at all-time highs and coming off them. There’s been a huge drive over the last couple of years to find what will be core absolute-return drivers across a portfolio. Many investors don’t want any more exposure to long equities and don’t want any more long exposure to fixed income or credit. So, they ask, ‘what other asset classes can give me a non-correlated absolute return with a low beta to the equity market?’ That’s why we’ve come out with this Fund. It’s been out for a number of years, but I think now is really sweet spot for it. It’s had fairly strong returns over the last couple of years. It has really low correlation to equity markets. People are looking for different ways of generating returns. We’ve seen in particular this year, commodities are the best-performing assets across the Fund. Previously, it was currencies really driving it. The ability to identify trades or strategies that can perform in markets that don’t include equities and rates is going to be in high demand in the near future. Q: Some investors may not be comfortable with the idea of owning or shorting currencies or commodities – why is it important to include those asset classes? That’s where your diversification benefit really comes from. Even being long commodities and long currencies will offer some sort of diversification benefit but being able to short adds to that. And to be honest, that’s actually how you protect yourself in part if you do see a larger pullback in market. I think back to 2008 and I look at some of the core things that performed for us in our previous portfolios, and it was short wheat and short energy. They were two of the best short performers, even outperforming short equities. The best currencies were long US dollar and in particular short British pound. Even though everyone associates 2008 with the credit crisis when equities went down substantially, there were other parts and other instruments in the market that were even better short candidates that helped drive decent returns in a pretty tumultuous period. With asset values inflated to where they are, the ability to short and be able to identify securities that may be vulnerable in a downturn – that’s a big addition to any type of 60/40 asset mix. Q: How do you risk manage the Fund? We’ve built out a ton of technology and systems that helps us manage the complexity of it. It’s fairly straightforward and seamless to us, even though from the outside it might look like a lot of positions. But the complexity is actually fairly easy to manage. There’s not too much touching of the portfolio on a daily basis. In terms of larger decisions, we do use quantitative tools but sometimes we do have to step in and make more of a qualitative decision. For example, when the Swiss franc peg blew up a couple years back, the Fund wasn’t in a huge drawdown, but we decided to trim our Swiss franc exposure back a little bit. That was more of a qualitative-type decision that we felt best suited the overall risk profile of the Fund. From time to time, we’ll step in and manage risk actively. Q: How would the strategy react in a major market decline? The equity side will get impacted, but as markets sell off and continue to sell off, we’ll try to minimize that net long-equity exposure to the minimal amount that we can. In terms of commodities, we will short the more cyclical, risk-on types of commodities – usually energy and base metals that are in general associated or correlated to global growth. I’d imagine we’d migrate short across the board. In currencies, we have the ability to increase the Fund’s long exposure to US dollars versus more vulnerable currencies – and that’s a big hedge as well in those scenarios. We can’t promise returns, but that’s how the portfolio would probably migrate. With those kinds of tools at our disposal, with the ability to get outright short, we’re going to perform much better than an outright long position in the S&P 500.